This Butterflied Chicken Fajita recipe from Old El Paso™ is made complete with a warm capsicum salsa. This recipe for 4 turns an Old El Paso™ Fajita Kit into an impressive meal, perfect for entertaining or a break from boring dinners. Just add fresh ingredients like tomatoes, onions, capsicum and chicken for a meal that is sure to impress! 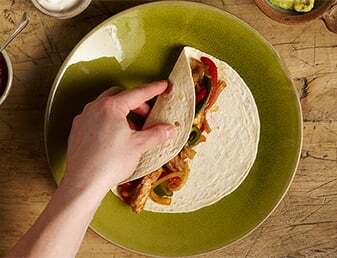 This Old El Paso™ recipe makes 8 Classic Chicken Fajitas with delicious accompaniments like smashed avocado, chili and coriander salsa. Our Fajita Kit makes this meal so easy! Full of flavours like lime & chili this meal has all the spice and zest Mexican food is famous for!